Chinese Premier Li Keqiang has wrapped up his three-day visit to Kenya while also ending a week-long trip to Africa. 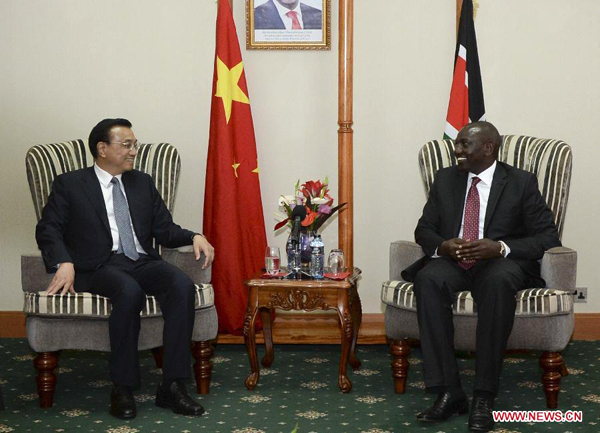 The last leg of Premier Li’s visit saw the signing of an agreement to build a railway linking the Kenyan capital Nairobi with Mombasa, the country’s second biggest city and an important Indian Ocean port. The first phase of the railway project will cover 609 kilometers, and cost about 3.6 billion U.S. dollars. Ninety percent of the financing will come from the Export-Import Bank of China. The railway project marks the beginning of a continent-wide rail network that will connect six countries in East Africa. Premier Li says economic growth in East Africa needs support from such infrastructure as railroads, a sector where China has considerable experience and capacity. “We hope to see further growth in the manufacturing sector in African countries, in particular labor intensive industries to generate more local jobs, especially for young people,” Li said in an interview. Posted on 12th May 2014 by newsafrica. This entry was posted in Africa, China, Economy, Headlines, Kenya and tagged Africa, China, Exim Bank of China, Kenya, Li Keqiang, Mombasa, Nairobi, Premier of the People's Republic of China. Bookmark the permalink.